Concrete specialists from a Shropshire firm have unveiled a new self-compacting product. The team from TG Concrete, which is part of the Tudor Griffiths Group, is renowned for its innovative approach, and the latest addition to its catalogue is already attracting a great deal of interest. 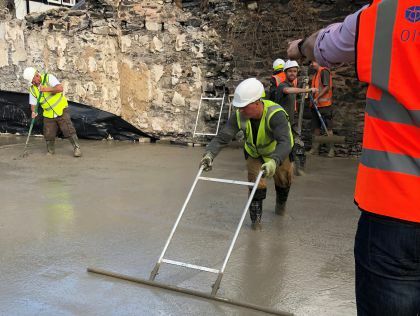 TG Concrete general manager, Dave Morris, said one of the first installations had already been completed on a project in conjunction with Knights Construction Group, from Wrexham. The concrete can be poured quickly, and it flows and spreads effortlessly to deliver an exceptional result. “This means the process is much quicker – but it’s not just time and money that can be saved. This form of installation reduces noise and eliminates vibration, so conditions on site are vastly improved too,” said Dave. He said thanks to the easier installation process, large pour sizes were achievable with reduced labour and plant requirements, which in turn reduces health and safety hazards. Dave said the concrete could be used in any kind of construction and was ideal for jobs with difficult access or where longer pumping distances were involved. The concept of self-compacting concrete originally came from Japan after the country’s construction industry experienced a decline in the availability of skilled workers, and research has been carried out all over the world in a bid to develop the very best products. As well as self-compacting concrete, the TG Concrete team has developed a varied catalogue of products including polished concrete, coloured concrete, AgriCrete specifically for agricultural clients, and TG Cemfloor – a quick-dry liquid self-levelling screed for floors.